The Crystal Tuner 4096 Hz (part of the Angel Tuners Set) amplifies the energy with which any crystal can heal, particularly quartz crystals, through sound vibration. Any crystal activated by the Crystal Tuner creates a bridge between the Cosmos and the physical body. 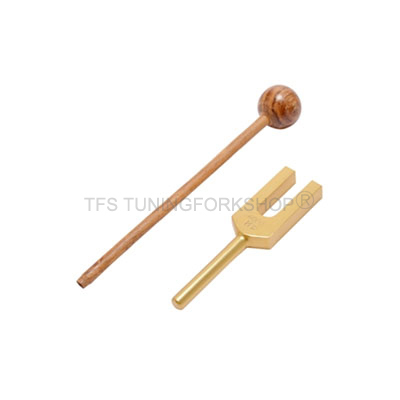 Free Wooden Mallet with this Tuning Fork Set. All Forks are in attractive Velvet Pouch. The Crystal Tuner 4096 Hz (part of the Angel Tuners Set) amplifies the energy with which any crystal can heal, particularly quartz crystals, through sound vibration. This Tuning Fork is used for activating any crystal while directing its energy towards the receiver. This is done by striking the Fork on an activator or on some hard surface, placing its stem end on the crystal and directing it towards the wanted receiver. A crystal, thus activated, produces a bridge from the physical body to the cosmos. If a Quartz Crystal is to be cleared or energized, just tone the Tuning Fork & move it around the crystal. If a Quartz Crystal is to be programmed. Again, just tone the Tuning Fork & move it around the crystal and send the wanted thoughts across while doing the process. The Fork is also used effectively to remove unwanted energies already resent in a crystal. This is done by striking it on an activator and holding its stem end on the crystal for half a minute.